Doxpop's transition to the new Tax Warrant service is complete. If you are not already using the "tax warrant" tab for all of your tax warrant research, it is time to make the switch. At 5:30 AM on Friday, 3/31/17, we will be turning off access to tax warrants through the "court cases" tab. From about 5:30 AM to 5:45 AM the site will be down while we install an update that includes this change. On February 9th, Doxpop introduced a new tab that our subscribers can use to search for Tax Warrants across the entire state with a single search. Prior to our investment in this new service, we were only able to provide tax warrants in 23 out of the 92 counties, so this service increases our geographical coverage to roughly 4 times that of the previous service. During the introduction of this service, we continued to provide access to the tax warrants that were available through our old court records service while we gathered feedback on the new tax warrant tab. The main feedback we got was that although most of those who tried the new "Super Search" method of searching for tax warrants loved it, those who had built their search procedures around our traditional searching tools hated it. In response to this feedback, on February 28th we added the ability to search the statewide tax warrant database using either the Super Search or our traditional search tools. We have now had this service running in parallel with the old service for a month with both search options enabled, and our users are reporting consistent and accurate results. That means it is time to turn off the old service and ask you all to begin using the new "tax warrants" for your searching these records. From this point forward, tax warrants will not be commingled with court records, and you will only be able to find them through the "tax warrant" tab. The folks who are accessing tax warrants through the court api service will continue to have access to the tax warrants from the original smaller group of counties through the api because we don't yet provide an api for tax warrants. The Monroe County Clerk's Office would prefer that sheriff fees for service be paid directly to the sheriff. They are still accepting these fees in their office when necessary, but would like to no longer need to accept them over the coming weeks. Please begin to submit your service fees to the sheriff, even though the option to pay this through E-Filing may remain for a short while. Doxpop has just added the Boone County Trial Courts to our database of current court records. Court case Information is available for Boone County Circuit Court, Superior Courts 1 & 2 from January 1994 forward and Zionsville Town Court for September 2013 forward. All Doxpop services are now available for these courts. This includes services like having your hearing calendar delivered directly to your mobile device or office calendaring system and setting alerts on cases. Also in recent news, Hancock, Tippecanoe and Wabash County Courts have all commenced e-filing. We welcome them to the group of courts that Doxpop provides E-Filing services for! Tippecanoe has an interesting twist that you should be aware of. They are the first county to implement the E-Filing system using the "Quest" CMS, which many counties use to manage their juvenile cases. 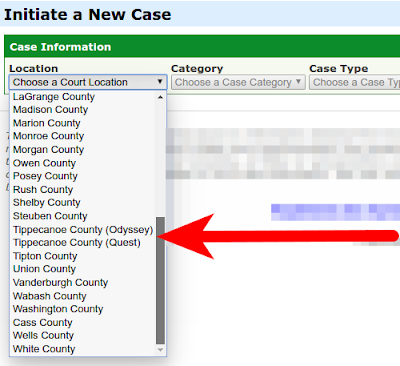 When filing a new juvenile case, in the "Location" selection, choose "Tippecanoe County (Quest)" from the drop-down menu. When a new case that is anything other than juvenile, choose "Tippecanoe County (Odyssey)" from the drop-down menu. When looking up a confidential juvenile case to submit a subsequent filing, use the "Find E-Filable Cases" menu item under the "my doxpop" tab. Let us know if you have any questions about how the separate Tippecanoe location entries function. If you are in one of the counties that recently started e-filing, give us a call lo learn how to begin e-filing through Doxpop and obtain training at no cost! Call 866-369-7671 or email support@doxpop.com.